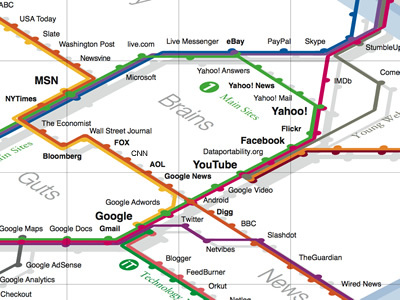 This is the third version of the well-known Web Trend Map, by the strategic design agency Information Architects, based in Tokyo, Japan. This new design is a major improvement from the previous version, in particular for its enhanced cleanness, organization and legibility. For this third version of the Web Trend Map, Adrian Schaffner's work has been a major source of inspiration for the authors. 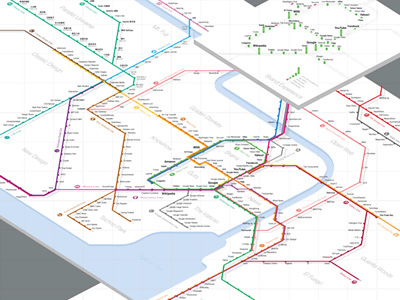 As they explain on the site: "After meeting with our good friend Adrian Schaffner from evoq over the holidays, we studied his impressive work with mapping the Swiss train stations and adopted a few of the concepts ourselves. Instead of cluttering the main stations with additional information, we elaborated on their trends by adding two new layers: brand quality and interface quality." [UPDATE 31-JAN-08] - The map can now be downloaded here. As much as I heard there is so much traffic on this server that iA had to change to a more powerful system. It should work now again without problems.